NOTE: HomeGroup is exclusive only to Windows 7, Windows 8, and Windows 8.1 operating systems. You will not be able to add a computer running on a Windows XP, Vista or Mac OS X® operating system to your current HomeGroup. 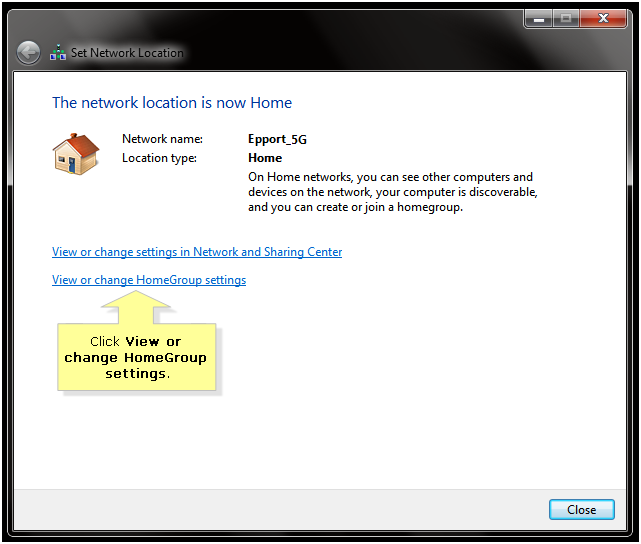 For instructions on how to change HomeGroup and sharing options on a Windows 8 or Windows 8.1 computer, click here. To find out how to set up the sharing capability for each Windows-based operating system, click here. Click the wireless icon located at the bottom-right of the screen and click on Open Network and Sharing Center. Click on the link below your wireless network’s name. 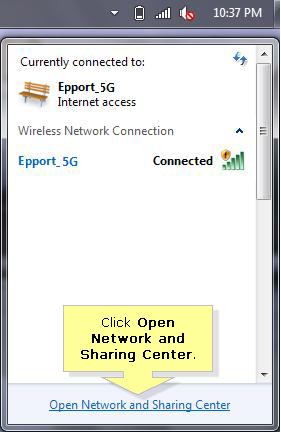 NOTE: In the example used, the wireless network name is Epport_5G. 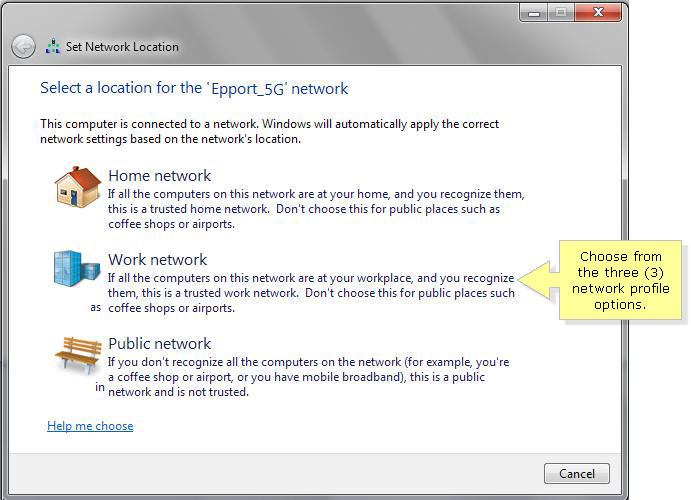 Choose from the three (3) options according to its network type. NOTE: Different network profiles will have different options of file sharing which you can customize. For example, click on Home network if you wish to change the sharing options for Home network. QUICK TIP: You can learn about the difference between Home, Work, and Public networks on the description inscribed on each option. Click on View or change HomeGroup settings. 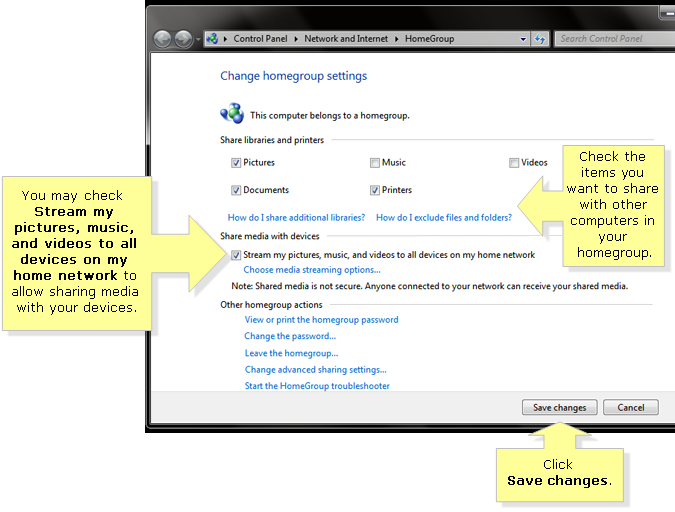 On the Change homegroup settings window, check the items you want to share with other computers in your selected homegroup. NOTE: You may check Stream my pictures, music, and videos to all devices on my home network to allow sharing media to your devices within the network. These devices must be connected to the home network to enable shared media. NOTE: You can click on the box again to remove the check marks and unshare the items from the Homegroup. Click Save changes to confirm your choices. 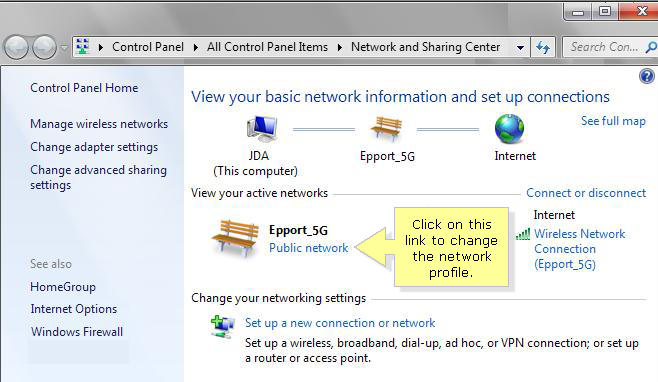 You should have successfully changed the HomeGroup and Sharing Options of your network profiles now. QUICK TIP: Your network connection must have IPv6 enabled to create or join a HomeGroup. To verify if your system is capable of IPv6 connectivity, click here. For more information regarding HomeGroup settings, contact Microsoft support for details.